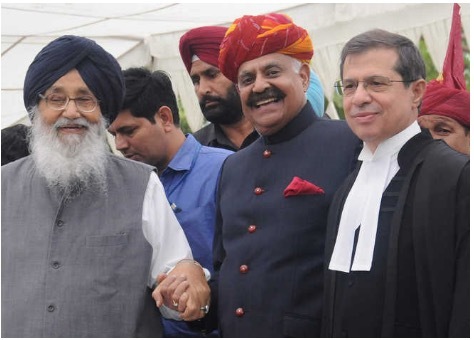 VP Singh Badnore was sworn in as Punjab Governor by High Court Chief Justice SJ Vazifdar in Chandigarh on Monday. Zero tolerance to drugs in Punjab, abuse and to resolve to collectively promote a healthier society through yoga and sports; getting Amritsar and Jalandhar on the Smart City program; modern irrigation techniques; crop diversification, innovation, and research in agriculture — are some of the issues that the Governor says he will immediately look into. “Sarkar chalegi sanskar ke sath” is the message that Punjab Governor VP Singh Badnore has for the people of Punjab and Chandigarh. Badnore insists that his priority will be to run the government with a human touch. “Bade buzurgon ki dekhbhal, this is an inherent part of our culture and I will be reinforcing these values,” he said during an interaction with journalists after the oath-taking ceremony. In between, taking time to meet journalists, he outlined his priorities for both Punjab and Chandigarh. “Development has to reach each and every strata of the society,” he said. Clearly indicating that he will be “taking stock of development works at regular intervals to assess the distance covered, and the momentum needed to go forward”, he said he would elicit views from the people of Punjab in this venture. Badnore, 69, who belongs to Bhilwara, replaces Kaptan Singh Solanki, who is the Governor of Haryana and was holding additional charge of Punjab Governor and Administrator of Chandigarh Administration since January 2015.